Though NATO and other military forces increasingly recognize protection of civilians as a key objective in their operations, implementation remains challenging. To effectively protect, the military force must understand the threats that exist and match capabilities to counter them. The authors strongly believe that military planners need a more formal structure to conceptualize physical protection, and here outline ‘The Protection Ladder’ as a tool for military planners and leaders, to explain the legal obligations and additional operational capabilities necessary for civilian protection. The article offers practical suggestions on how civilian protection can be effectively addressed before, during and after military operations. NATO should develop its protection capabilities, for future mission success depends upon it. The protection of civilians is a key objective of most international military operations. Yet civilians still continue to suffer in conflicts around the world. Since the early 1990s, the North Atlantic Treaty Organization (NATO) has conducted operations where the protection of civilians was a key component—either explicitly mandated or carried out by default to successfully achieve the mission—with varying degrees of success, and in some cases failure. This situation is not, however, unique to NATO. Implementation of protection of civilians remains a priority and challenge for many multilateral organizations, including the United Nations (UN) and the African Union (AU). This is partly due to the fact that different organizations understand protection of civilians differently, depending on their mission, capabilities, and areas of operations. While some policy, doctrine, guidance, and training have been developed, the ability to ‘operationalize’ civilian protection—creating and employing the force capabilities to actually protect civilians and vulnerable populations in a conflict—is still lacking. This article does not focus on the decision by policymakers to intervene or what happens after an intervention but rather on what happens in the middle—on creating a better operational understanding of protection of civilians for NATO that is more in line with civilian expectations and the particular types of threats they will have to be protected from. One useful way to conceptualize the various levels of physical protection is through The Protection Ladder, a theory that will be put forward in this paper. It will be shown that the hierarchical illustrative tool helps military planners understand the legal obligations and additional operational layers necessary to protect civilians from physical harm. Finally, the article outlines practical ways to better operationalize civilian protection before, during, and after operations. It is the authors’ hope that the development of a more robust understanding of protection of civilians for NATO will enhance NATO’s capability to protect more civilians in future operations. Protection of civilians is a matter of political will, not just military might. Troop-contributing countries may have to make difficult decisions about trading their soldiers’ lives for the lives of civilians. At some point, there must also be a transition from armed conflict and stability operations—ideally to a state of peace where the rule of law and full attainment of human rights are made possible. Transitions have not always been successful, representing failures by both military and civilian actors. Experience has shown us that without a holistic approach to stability and peacekeeping, including the protection of civilians, overall mission success may prove elusive. Once a political decision has been made to intervene in a particular conflict, military planners must develop a cohesive strategy for the military operation. Protection of civilians can become an objective in military operations in two different ways. NATO has experience with both. First, protection of civilians may be the main objective of an entire operation—for political or moral reasons—to stop large-scale violence being perpetrated against a segment of the population. This was the case during Operation Allied Force to stop the ethnic cleansing of Albanians by Serbian forces in Kosovo (1999) and during Operation Unified Protector to stop the Gaddafi regime’s violent crackdown on its own population in Libya (2011). In both instances, NATO played a primary role through its use of airpower to impose no-fly zones and strike Serbian and Libyan military targets. While the operation in Kosovo did not have a mandate from the United Nations Security Council (UNSC), the operation in Libya did. Second, and most commonly, protection of civilians may be one of several objectives in a larger military operation. For example, in Afghanistan, while protection of civilians was not part of the explicit mandate of NATO’s International Security Assistance Force (ISAF), it was arguably one of the most important military-strategic goals of the mission—receiving a greater amount of attention six years into the mission as security and kinetic operations expanded. Operations that are not explicitly mandated to protect civilians usually have a different primary goal such as counterinsurgency or counterterrorism. For example, the protection of civilians in many NATO operations is focused on the strategic goal of containing threats to member states, and others when requested, and preventing the spread of terrorism. But to a lesser extent they are focused specifically on the proactive protection of civilians. It should be noted that a failure to protect civilians—both from harm caused by one’s own operations and that of other actors—may severely damage a force’s ability to achieve its primary goal (Kelly 2010). Regardless of the reason for intervention in a conflict, civilians expect to be protected.1 They are not always able to differentiate who has harmed them, but they often have a keen understanding of who has the means to provide security and protection. When forces fail to meet civilian expectations of protection or cause harm themselves, anger and resentment grow, and populations can be driven away from the forces they once relied on for protection. In the absence of security provided by NATO, for example, the population will support whatever actor can provide it, as was the case in some areas of Afghanistan (Department of the Army 2012). The failure to protect can also damage the legitimacy of the warring parties, lead to state collapse, perpetuate cycles of violence and internal displacement, and affect neighboring countries with refugee flows. It should be kept in mind that killing numerous insurgents will be seriously counterproductive if collateral damage kills peaceful civilians too. That will create legitimacy for the insurgency and lead to increased support from the population. For this reason commanders have to establish procedures to achieve a balanced use of force and to avoid any excessive use of force that leads to collateral damage. In Afghanistan, for example, one could make a convincing argument that protection—both from ISAF’s own operations and the operations of other anti-government groups—should have been a key focus from the beginning. Research by CIVIC (2009) and others has shown that key strategic ground and civilian support was lost due to mounting civilian casualties both from their own operations and the operations of their adversaries. ISAF eventually amended their tactics and became more effective at avoiding civilian harm from their own operations, but it was late in the game and scores of civilians were still being harmed by other groups. For example, one major source of harm to Afghan civilians was anti-government groups’ use of inherently indiscriminant improvised explosive devices (IEDs) to target international and Afghan forces. In this case, the mere presence of international forces increased possible harm to civilians by IEDs in some areas, compared to areas where there was no presence. However, ISAF’s counter-IED initiatives, which started out as a force protection measure, soon became a proactive protection measure and reduced civilian harm. Unfortunately, this situation is indicative of the doctrinal gap in many organizations expected to protect civilians today (Giffen 2010). While interveners may have the best intentions, they often do not have a robust strategic understanding of protection challenges, operational tools, and tactical training needed to effectively protect civilians from violence. The implementation of protection of civilians requires understanding, knowledge, and training on how to actually achieve this objective on the ground. International, regional, and national military staff generally lack guidance on how to protect civilians more effectively during military operations. This is because there are no historical or tested principles or doctrines to draw upon for military or political staff involved in the planning and execution of the mission. This lack of guidance leaves planners struggling to ‘build the plane while flying it’. This is a particular challenge for missions mandated to protect civilians as their primary goal, as lives that are already lost cannot be recovered. Without well-developed doctrine and the ability to effectively implement such a doctrine, failure is likely. It should be noted that to be successful in complex environments militaries must build in flexibility to allow for quick adaptation as the situation on the ground can change rapidly. [The Protection Onion is an] adaptation of the ICRC’s “egg framework,” which was developed in the late 1990s to depict the relationship between patterns of abuse and what the organization saw as the three forms of protection activities (responsive, remedial, and environment-building). This emphasizes that protection can be thought of in minimalist (physical survival) or maximalist (the enjoyment of rights) terms and hence as a concept that contains many interconnected layers. Ideally, civilians would be able to enjoy the whole package, but in practice they can lose the outer layers of protection and still survive, although clearly some individuals can endure more than others. The inner core of physical protection, however, is vital for all the other layers. A military force alone cannot undertake all of these activities. It must understand what the protection of civilians entails and identify where it can be most helpful in the larger protection space. For policy makers and military planners involved in the deployment of intervention forces, the focus should be on the ‘inner core of physical protection,’ as it is where a military intervention can have the most utility through measured use of force. To effectively protect, the military force must understand the threats that exist and match capabilities to counter them. This is a unique role, one that other unarmed actors are unlikely able to play. Actors such as NGOs and civil society have other important roles in providing protection—for example, addressing humanitarian concerns. While a military force’s main focus will be on physical protection, there may be occasions when it chooses to cooperate with counterparts on other levels, for example, in logistical assistance in the provision of basic necessities. Effective communication with counterparts focused on protection of civilians is imperative to maximize all capabilities. All activities aimed at obtaining full respect for the rights of all individuals in accordance with international law—international humanitarian, human rights, and refugee law—regardless of their age, gender, social ethic, national, religious, or other background. Protection of civilians in armed conflict (POC), whereby all parties to the conflict are responsible for ensuring that the civilian population is respected and protected. NATO’s current understanding of protection of civilians differs greatly from that used by other international and regional organizations such as the UN and the AU. While NATO has yet to adopt a formal definition of protection of civilians, in past conflicts it has focused primarily on protecting the population from their own actions. In an environment where these actors work together, varying definitions of ‘protection’ can wreak havoc on even the best-laid protection plans. After years of working on this issue, the authors strongly believe that military planners need a more formal structure to understand the several layers of physical protection. The Protection Ladder was designed by Center for Civilians in Conflict as an illustrative tool for military planners and leaders to explain the legal obligations and additional operational layers involved in civilian protection (See Figure 1). The ladder is meant to help conceptualize and operationalize these various layers—what we call ‘rungs’. Capabilities must be established on each rung to achieve the full range of civilian protection. The skills learned on each rung provide a foundation for the next. As with any ladder, the greater the number of rungs, the stronger the structure and the greater its reach. 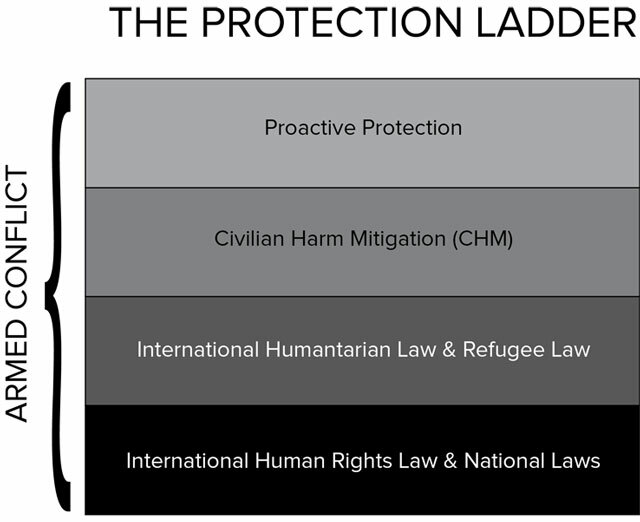 The Protection Ladder is a conceptual framework to understand the various layers of physical protection security forces can provide to civilians either by adherence to existing national and international law or the adoption of specific policies and procedures that go above and beyond what is required. The foundational rung of protection is the application of national law and international human rights law. These laws are applicable during times of peace as well as civil unrest and armed conflict. They are also the foundation for civilians receiving protection from their government and other actors. In most cases police and gendarmerie are the primary upholders of these laws. If security forces and other armed actors are found to have violated these laws, the violators should be prosecuted through the appropriate channels. International humanitarian law (IHL) and refugee law exist to protect civilians from the dangers of armed conflicts. It prevents parties from directly targeting civilians (distinction) and from causing excessive incidental civilian damage while attacking military targets (proportionality). It also calls on parties to conflict to take all feasible precautions to avoid harming civilians. Militaries who adhere to IHL cause less civilian harm during their combat operations. However, in today’s conflicts, many armed actors (both government and armed non-state actors) either fail to consistently adhere to IHL or choose not to adhere at all. When there are violations of IHL, they must be documented and prosecuted. Despite the best efforts of a given military operation, and even when the principles of IHL are rigorously applied, harm to civilians may nevertheless occur as a direct consequence of the use of force. This type of harm can happen during planned operations or in self-defense. This ‘incidental harm’—often referred to as ‘collateral damage’—while not illegal must be minimized, investigated, and appropriately addressed by the military force. Armed actors may also deliberately target civilians, because they believe it can serve their overall objectives. In this case, a third actor is needed to intervene to prevent or mitigate the violence. Those who specifically target civilians are responsible for the vast majority of civilian casualties. This has led to the realization that protecting civilians from physical violence often requires proactive use of force against the perpetrators. This could mean establishing a presence near vulnerable populations, patrols, placing oneself between the perpetrator and the potential victim, and/or proactively seeking out those who wish to harm civilians and neutralizing the threat. The key decision facing staff involved in the planning or execution of such operations, is matching these approaches to particular situations. Civilian protection is first and foremost about creating a mindset—a way of thinking among policy makers, military planners, commanders, and soldiers. It must be adopted as strategy and policy and then trained throughout the chain of command to ensure that everyone from the highest commander to the lowest ranking soldier understands the concept and why it is a key part of a successful mission. Strategy, planning, and training are pivotal to NATO’s success in the protection of civilians. Without an explicit focus on protection of civilians in this ‘before’ stage, there is little chance of effectively protecting civilians in the conflict. The concept of protection—including a definition in line with other international organizations—should be adopted in standing NATO political and military policy, independent of any given conflict. Protection should be prioritized in strategic planning and taught in scenario-based trainings. It should become a part of the military decision-making process and, indeed, the decision-making process of the individual soldier. The Civilian Casualty Mitigation Team (CCMT) and the Nonbinding Guidelines on Monetary Payments to Civilian Casualties in Afghanistan are examples of effective NATO policy and practice but these exist only in an individual conflict. These practices have yet to be enshrined by NATO in standing policy and therefore the lesson identified in these recent conflict risk being lost rather than learnt. We discuss these practices further in the During Operations section. Eventually, it is the perpetrators who decide what kind of threat they pose to civilians. It is impossible to answer the question of “how” civilians can be protected without knowing why, how, and with what methods perpetrators use in the first place. The proactive part of protecting civilians is where guidance is most lacking, and all organizations have struggled to operationalize the task, including NATO. Previous research has found that the overall scope of threats that NATO may face can be divided into seven scenarios (Beadle 2014). Genocide, where perpetrators seek to exterminate a communal group (e.g. Rwanda, 1994). Ethnic cleansing, where perpetrators seek to expel a communal group (e.g. Kosovo, 1999). Regime crackdown, where regimes use violence to repress any resistance (e.g. Libya, 2011). Post-conflict revenge, where individuals or mobs take revenge for past crimes (e.g. Kosovo post–1999). Communal conflict, where whole communities seek both to avenge a previous round of violence and to deter further retribution as a means of protecting themselves (e.g. Ituri, DR Congo, 1999–2003). Predatory violence, where perpetrators exploit civilians to survive or for profit (e.g. Lord’s Resistance Army, 1994–present). Insurgency, where rebels target civilians as a means to control the population and to undermine the control of other actors (e.g. Afghanistan, 2002–present). NATO has encountered most of these scenarios and also stands out as one of few actors that may be expected to protect civilians from all of these threats, including interventions in the worst-case scenarios of large-scale violence against civilians. Each of these situations poses a fundamentally different threat to civilians in terms of which civilians are at greatest risk, how they are targeted, what capabilities the perpetrators rely on to conduct violence, and what kind of civilian suffering it is likely to produce. This underscores the importance of identifying the particular type(s) of threats civilians are faced within the area of operation. In most conflicts, however, several scenarios may unfold simultaneously, in different areas or during phases of a conflict. For instance, what started as a regime crackdown on armed and unarmed opposition in Kosovo during the mid-1990s eventually escalated into ethnic cleansing of the Albanian population by 1999, prompting NATO’s intervention. Following the Serb withdrawal and NATO deployment, the ethnic cleansing was followed by post-conflict revenge against Serbs and other non-Albanian minorities. This again escalated into ethnic cleansing of the remaining Serbs in 2004. The point is that continuous threat assessments of the perpetrators are essential to achieve effective physical protection. Some scenarios may also unfold at the same time involving the same perpetrator. For instance, a communal militia may simultaneously be attacking another community as a way to protect their own, while behaving in a predatory manner against all communities in the area. Other motivations for targeting civilians are mutually exclusive. It is for instance impossible to expel and physically exterminate a whole group of civilians at the same time. There may also be different motivations within the perpetrators’ ranks. For individual fighters, they may gain respect from their comrades or be driven by a fear of being killed themselves. For mid-level leaders, it may be to acquire power. That said, in order for violence to become systematic and widespread enough to prompt a military response, the overall situation is likely to fall into one of the categories of perpetrator motivations listed above. The main implication is that different scenarios require different military responses if civilians are to be protected, without causing more harm in the process. On the one hand, this requires responses that reduce the vulnerability of targeted civilians and support their own coping strategies, such as by building infrastructure that allows them to access water within a relatively safe distance and by providing information about possible threats (Gorur 2013). On the other hand, it often requires using military forces to address the threats of violence more directly. Assistance with the delivery of humanitarian aid to ameliorate the crisis (e.g. transport, air drops, construction of camps or roads, convoys, securing storage facilities). Containment of the conflict (e.g. no-fly zones, embargoes, securing weapon depots). Deterrence or defense against attacks on civilians (e.g. patrols; escorts; protection of safe areas/zones like villages, stadiums, public buildings or camps; interpositioning). Coercive use of force against perpetrators (e.g. threats, show of force, strategic punitive strikes). Attack or defeat of perpetrators (e.g. strategic air strikes, direct action, war-fighting). The central question for military planners is: Which of these approaches are most likely to protect civilians from the conflict situation and the particular type of perpetrator they face? This question can be answered according to two principles. First, to have a strategic effect, the response must mirror the perpetrator’s original motivation for targeting civilians. For example, genocidal perpetrators, who perceive the situation in zero-sum terms and have decided that extermination of a specific group is the only viable option, are highly unlikely to be deterred. Lessons from previous genocides, such as with the Hutu extremists in Rwanda and Nazi Germany during World War II, indicate that these perpetrators will continue exterminating civilians until they are completely defeated. By contrast, predatory armed groups who only target civilians to acquire resources necessary to survive (e.g. by plundering food or forcibly recruiting children to maintain their ranks) are much easier to deter and can be coerced into stopping altogether. This is because their primary motivation is to stay alive, which means that they will seek to avoid confrontation. That is why they typically target undefended locations where risks are low and rewards are high. In the past, even limited shows of force have caused many fighters to demobilize and disarm. Second, the operation needs to match the perpetrator’s specific modus operandi. This requires a deeper understanding of how perpetrators target civilians and what they require to do so. For instance, NATO carried out similar actions during the operations in Kosovo and Libya, but the outcomes were quite different in terms of protecting civilians from the respective threats they faced. In both operations, NATO imposed a no-fly zone and conducted air strikes against military targets and command and control locations. However, the threats to civilians were different, which meant the utility of this operational design would differ, too. In Kosovo, Milosevic sought to expel a large portion of the Albanian population through demonstrative use of violence. The purpose was not to kill or even to control them in the future, but to make them leave. Doing so only requires freedom of movement for irregular, paramilitary units to conduct brutal violence that makes people flee in advance. Thus, striking conventional military units had little effect on the Serbian regime’s ability to conduct ethnic cleansing, because these operations could be conducted without support from conventional forces. The operation eventually took far longer than expected, and around 90 per cent of Kosovo Albanians were displaced, many of them expelled during the air campaign itself. Even though Milosevic eventually conceded defeat, withdrew his forces, and Kosovo Albanians were allowed to return, it could hardly be argued that the operation itself successfully protected civilians from expulsion. In Libya, Gaddafi did not seek to kill or expel a certain group of the population but to control the population. To do so, he depended on crushing all opposition, both armed and unarmed. This first and foremost requires substantial firepower (as demonstrated also by the weapons used by Assad in Syria, including aerial bombing, SCUD-missiles, and weapons of mass destruction). In fact, regime crackdowns are the only situations where regular forces and heavy firepower are the units primarily responsible for violence against civilians. Thus, targeting Gaddafi’s regular forces and command and control abilities in Libya degraded his ability to target civilians. Compared to the air campaign in Kosovo, civilians were gradually protected from the threat posed by Gaddafi. This threat was removed by Gaddafi’s death—likely to be the only way, as few authoritarian leaders whose main objective is to save themselves have ever negotiated themselves out of power. However, the post-conflict revenge that followed was left unaddressed; the gradual deterioration of the security situation has created new and different types of threats to civilians. In most of the situations listed above, some sort of offensive use of military force will be needed to reduce the physical threat to civilians. However, this involves the potential risk of causing harm to civilians during protection operations. The more serious the threat to civilians, the more the use of force is likely to be required to confront the perpetrators—and the higher the danger it is likely to pose to civilians. This risk of harm can be reduced through the adoption and implementation of civilian harm mitigation policy, tools, and practices. For example, while there is often training of forces on the IHL rules of proportionality, distinction, and necessity, state actors or non-state armed groups that want to effectively protect the population from harm need to go much further to ensure this actually happens once a conflict begins. Protection requires advanced planning and tactics to push commanders and soldiers not just to ask themselves ‘Can I pull the trigger’ (under IHL, is it legal? ), but ‘Should I pull the trigger’ (under civilian harm mitigation, is it my best option, what are the ethical and strategic imperatives, is there a better way? ), and even ‘How can I prevent my enemy from pulling the trigger’ (under proactive protection, can I prevent harm to civilians?). All of this should be done in advance of the start of military operations. As additional lessons are learned, commanders’ guidance, rules of engagement, and other directives should be revised accordingly and fed into in-mission trainings. In order to ensure that an armed actor’s use of force is actually effective in protecting civilians, commanders must have a real-time understanding of how civilians are being harmed. A military force should maintain a small team to advise the commander on civilian protection. Within this team it is important to develop the capability to consistently track in a centralized database all civilian harm caused and systematically analyze the data for trends, challenges, and lessons learned.5 While a relatively new concept in warfare a ‘tracking cell’ generally consists of several expert staff and appropriate hardware and software for data tracking and analysis. By adding this analysis to the commander’s feedback loop, challenges to protection can be addressed. Tactics can be adjusted to better protect, and in-mission trainings created to ensure soldiers have up-to-date protection tools, so ultimately, more lives can be saved. Similarly, proper investigations into every incident of potential civilian harm allow the military to absorb crucial data about threats to civilians. NATO has done this in Afghanistan. No less important but much harder to assess is the degree to which one’s actions lead to better protection from armed actors deliberately targeting civilians. Assessing physical protection of civilians from perpetrators of violence can be done in several ways (Beadle and Våge 2014). Beyond simply tracking civilian harm, the mission must monitor civilian behavior, civilians’ perception of security, shifts in territorial control, delivery of humanitarian assistance, and perpetrator capabilities. What constitutes a relevant measure obviously depends on the type of threat. For example, there is little point in assessing public opinion when most civilians are being killed (i.e. genocide). There is also little point in focusing on civilian deaths if large numbers of people are being abducted or displaced. What is particularly important from the perspective of military planning and execution is to monitor the perpetrator’s capabilities of violence. Reducing them is obviously one way of monitoring proactive protection of civilians, including the perpetrator’s ability to escalate violence. The only true way to determine whether civilians are actually being protected is to measure the civilian suffering against what could be expected to happen if the perpetrators succeeded and no protection effort were tried. While difficult, this can be done by assessing the perpetrator’s modus operandi and empirical evidence from previous conflicts where similar situations have existed. For instance, during previous genocides, more than half of the targeted group’s population has actually died. About 80 per cent of the Herero Africans were killed in Namibia (1904), about 67 per cent of European Jews during the Holocaust, and about 75 per cent of Tutsis living in Rwanda (1994). By contrast, only a few per cent of the targeted population is likely to be killed during ethnic cleansing. However, the vast majority (90+ %) is likely to be displaced either temporarily (as with the Albanians in Kosovo) or permanently (as with many Muslims who lived in what became Serb-controlled areas of Bosnia). All incidents of harm to civilians attributable to one’s own forces should be fully investigated. Cases found to be violations of international law should be dealt with through appropriate legal channels. Harm to civilians—including property damage, death, or injury—determined to be within the lawful rules of engagement of the peacekeeping force and thereby incidental should be acknowledged. Individuals or communities should be assisted accordingly. Making amends for harm within the lawful parameters of operations contributes to the preservation of human dignity and community healing. Strategically, acknowledging and responding to harm minimizes any hostility that may grow when harm is left unaddressed. Amends can range from apologies and dignifying gestures to other in-kind assistance, in accordance with local culture and victims’ preferences. From early on in the conflict several of the troop contributing countries were making payments to civilian families harmed by their combat operations. However, there were no standardized guidelines across NATO so civilians were treated differently depending on which nation harmed them. This sometimes caused confusion and anger amongst the civilian population (CIVIC 2009). In August 2010, NATO nations approved Non-binding Guidelines on Monetary Payments for Civilian Casualties in Afghanistan designed to synchronize troop contributing nation efforts to make amends to civilians harmed as a result of combat operations. While non-binding, these guidelines were incredibly important in getting nations on the same page with regard to how civilians should be treated when harmed by combat operations. Despite the positive effect this development had in Afghanistan they have yet to be enshrined in NATO’s standing policy or procedures. In Libya, civilians harmed as a result of the NATO air campaign were requesting these payments but with no policy in place their calls fell on deaf ears. One of the most important practices a military force can undertake post-conflict is to gather best practices and lessons identified. Lessons will not be learned until the strategic, operational, and tactical adjustments are adopted into standing policy and practice to ensure better performance in the next conflict. For several years, NATO has been conducting its own lessons identification process, including the release of reports on Libya and Afghanistan and an ongoing effort to map protection of civilians capabilities. It should also be noted that there is an inherent danger in simply replicating lessons from one theatre of operations to another without adjusting to address the specific threat. This is particularly true of lessons regarding proactive use of force to protect, where the threats to civilians and the utility of different military responses can vary greatly. Direct lessons are only useful insofar as one is faced with the same type of threat to civilians as one was in the conflict in which the lesson was identified. Therefore, lessons should be examined, amended, and applied within the existing conflict and context to ensure maximum efficiency. As long as wars are fought among, against, and in defense of civilians, the ability to protect civilians will continue to be a key capability (Beadle 2015). As new potential operations arise where protection of civilians will be important, such as in Syria, Iraq, or even Libya again, NATO should develop its capability to plan and effectively implement protection strategies. Building an effective protection response capability depends on having a comprehensive understanding of protection of civilians and a strategic focus on developing capabilities in implementation. NATO should develop its planning, preparation, execution, and assessment capabilities of future missions—regardless of whether protection of civilians is the primary objective or is essential for military-strategic reasons. Its success in future endeavors depends upon it. 1Based on a decade of CIVIC’s independent research with civilians garnering their perceptions, wants, and needs. Research has been conducted in Iraq, Syria, Afghanistan, Somalia, Pakistan, and Mali, etc. 2Protecting civilians from one’s own actions—commonly referred to as civilian harm mitigation (CHM)—is a very important part of the larger concept of protection of civilians but NATO has historically interchanged the definition of protection of civilians with CHM. 3The Norwegian Defence Research Establishment (FFI) has developed guidance for military staff on how key considerations on protection of civilians can be included during a regular NATO military planning process. See Beadle, Alexander W. & Kjeksrud, Stian. (2014). ‘Military planning and assessment guide for the protection of civilians’, FFI-rapport 2014/00965. Kjeller: Norwegian Defence Research Establishment. 4Making amends is the practice of warring parties providing recognition and assistance to civilians they harm within the lawful parameters of their combat operations, despite having no legal obligation to do so. At its core, the practice of making amends is a gesture of respect to victims. Amends can take a variety of forms and must be culturally appropriate. They can include public apologies, monetary payments, livelihood assistance programs, and other offerings in accordance with victims’ needs and preferences. 5Two distinct but connected approaches to documenting harm in armed conflict are emerging as good practice among militaries worldwide: ‘civilian harm tracking’ and ‘casualty recording’. Casualty recording is the process of recording every individual killed in armed violence (which includes but is not limited to armed conflict as defined by IHL) in a systematic and continuous manner. Civilian harm tracking refers to the warring party itself (state militaries, peacekeepers, military coalition members) systematically gathering and analyzing data about their operations and its effects on the civilian population, including data on civilian deaths, injuries, property damage and other civilian harm as appropriate. The goal of tracking is to use the analysis to update the warring party’s tactics and training in order to lessen civilian harm in future operations, ensure thorough investigations, and enable warring parties to respond properly to civilian harm, including by making amends for losses. Both casualty recording and civilian harm tracking are necessary and useful in that they work towards providing recognition of those killed and their families and serve to inform distinct actors who seek to address harm and improve protection. And where feasible, information from both approaches can be combined to produce the fullest understanding of civilian harm. Beadle, A W (2014). Protection of civilians – military planning scenarios and implications In: Kjeller: Norwegian Defence Research Establishment. FFI-rapport 2014/00519. Beadle, A W (2015). Protection of civilians as a new objective for military forces In: Norheim-Martinsen, P M and Nyhamar, T eds. International Military Operations in the 21st Century: Global trends and the future of intervention. New York; London: Routledge, pp. 195–205. PMid: 25444304. Beadle, A W and Våge, A S (2014). Assessing protection of civilians in military operations In: Kjeller: Norwegian Defence Research Establishment. FFI-rapport 2014/00966. CIVIC (2009). Losing the People: The Costs and Consequences of Civilian Suffering in Afghanistan. Available at: http://civiliansinconflict.org/uploads/files/publications/losing-the-people_2009.pdf [Last accessed 24 June 2015]. CIVIC (2014). Civilian Harm Tracking: Analysis of ISAF Efforts in Afghanistan. Available at: http://civiliansinconflict.org/uploads/files/publications/ISAF_Civilian_Harm_Tracking.pdf [Last accessed 17 July 2015]. Department of the US Army (2012). Civilian Casualty Mitigation. ATTP 3-37.31, para 1–43. Available at: http://armypubs.army.mil/doctrine/DR_pubs/dr_a/pdf/attp3_37x31.pdf [Last accessed 24 June 2015]. Giffen, A (2010). Addressing the Doctrinal Deficit: Developing guidance to prevent and respond to widespread or systemic attacks against civilians. International Experts Workshop. 21–24 September 2009, Shrivenham, United KingdomUK Defence Academy Available at: http://www.stimson.org/images/uploads/research-pdfs/1_-_Addressing_the_Doctrinal_Deficit_2010.pdf [Last accessed 24 June 2015]. Gorur, A (2013). Community Self-Protection Strategies: How peacekeepers can help or harm. Available at: http://www.stimson.org/images/uploads/research-pdfs/Stimson_Community_Self-Protection_Issue_Brief_Aug_2013_1.pdf [Last accessed 26 June 2015]. Kelly, M (2010). Protecting Civilians: Proposed Principles for Military Operations. Available at: http://www.stimson.org/images/uploads/research-pdfs/2_-_Proposed_Principles_Protecting_Civilians_2010.pdf [Last accessed 24 June 2015]. NATO (2011). Allied Joint Doctrine for Counterinsurgency (COIN) – AJP-3.4.4. Available at: https://publicintelligence.net/nato-allied-joint-doctrine-for-counterinsurgency/ [Last accessed 24 June 2015]. Williams, P (2010). Enhancing Civilian Protections in Peace Operations: Insights from Africa. Available at: http://africacenter.org/wp-content/uploads/2010/09/ACSS-Research-Paper-1.pdf [Last accessed 24 June 2015].